Persistence Market Research has recently conducted extensive study on the global hospital-acquired pneumonia (HAP) prevention market. HAP is the most common nosocomial infection occurring in hospitalized patients. HAP is defined as a lower respiratory infection, which does not incubate at the time of hospital admission but presents clinically 2 or more days after hospitalization. Incidence of HAP is more prevalent in the medical and surgical Intensive Care Units, and results in additional cost to the healthcare centers and increases the length of stay in ICU. The scope of the report includes market size of oral care products (FMCG + Medical based) in the Asia Pacific region. However, the scope does not consider the services cost associated with oral care protocol across hospitals. The report provides in-depth insights on key drivers to market growth, key factors hampering market growth, most impactful trends in the industry, and significant opportunities that are likely to hit the market in next few years. The report includes executive summary and market definition, which offer an introduction to the global HAP prevention industry and various aspects associated with it. Further, the report provides analysis of the HAP etiology, pathogenesis, and value chain involved in the marketplace. It also discusses the epidemiology of HAP, which indicates that the incidence of hospital-acquired pneumonia ranges from 5 to 15 cases per 1000 hospital admission, and is more frequent in general wards ranging from 1.6 to 3.65 cases per 1000 admissions. Incidence of HAP in ICU varies by geographical areas. For instance, in Europe, nearly 9.1% of total admitted patients developed hospital-acquired infection, with approximately 83% of cases being HAP, whereas in Asian countries hospital-acquired pneumonia ranges from 9% to 23%. The research methodology incorporates both primary and secondary research to collect the relevant market data. We have analyzed the global hospital acquired infections control market by considering the revenue through extensive primary research to understand the usage patterns, historic trends, problems faced by the medical staff, the required treatment developments, and most preferred products. Key opinion leaders have been considered for the primary research, including experienced healthcare professionals in various healthcare facilities at the country level. These estimates are further validated with product manufacturers, distributors, and suppliers. Extensive secondary research has been carried out to understand the treatment rate, adoption rate, regulatory scenarios, average selling price, and reimbursement scenario by referring to published scientific literature from various databases such as the WHO, PubMed, Springer, and Wiley among others. We have also analyzed various market companies’ annual reports, investor presentations, SEC filings, 10k reports and press releases to fetch substantial information about the market size, trends, opportunities, drivers, restraints and other market dynamics. With an expanding geriatric population worldwide, the immunity level is observed to fall significantly. These two factors are believed to collectively fuel the need for hospital-acquired pneumonia prevention in next few years. Growing prevalence of chronic diseases coupled with lengthy hospital stay duration will also elevate the chances of acquiring infections such as pneumonia, eventually pushing the demand for prevention of hospital-acquired pneumonia. Furthermore, promising trends in the industry such as medical tourism are considered responsible to create a heap of opportunities in the global hospital-acquired pneumonia prevention market in upcoming years. According to a recent research, the global market for hospital-acquired pneumonia prevention is expected to see moderate growth over a projection period of 2018-2026. While the market is currently worth US$ 795 Mn and is apprehended to witness 4.7% CAGR and reach beyond US$ 1,100 Mn by the end of 2026. The report predicts oral care products/kits intended for pneumonia acquired at hospital to hold significant growth potential, as a number of countries across the globe have already mandated the implementation of standard pneumonia prevention protocols in ICU and CCU sections, which include standardized oral care. This is observed to be a major booster to market growth over the past few years. Broadening patient pool and increasing rate of acquiring pneumonia among admitted patients in developing countries are anticipated to escalate the number of pneumonia cases in near future, especially in the Southeast Asian Countries. Emerging economies are thus foreseen to offer a range of opportunities in near future. 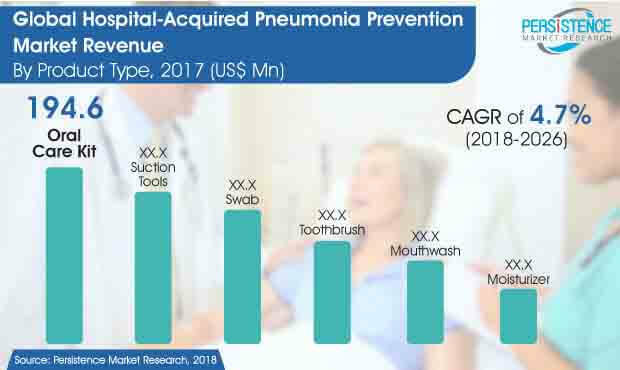 Among the six segments of the global market for hospital-acquired pneumonia prevention based on the product type, oral care kits segments currently accounts for more than 25% share of the total revenues. This segment is likely to retain a maximum value share of over 25% throughout the forecast period, followed by the suction tools segment. The latter is expected to occupy a value share of around 23% from 2018 till 2026, whereas another lucrative segment, i.e. swab will reportedly hold a revenue share of over 20% during the entire assessment period. Toothbrush and mouthwash segments are presumed to occupy decent revenue shares of around 11% through to 2026, whereas suction tools are slated to represent the fastest growing segment with an estimated CAGR of over 5%. Care-dependent neurologically impaired patients typically have an increased risk of oral colonization owing to complete care dependency, reduced cognitive status, immobility, and impaired swallow and cough. An enhanced oral care protocol is recommended for reducing the incidence of non-ventilator-associated hospital-acquired pneumonia. Overall standardized oral care protocols involve proper teeth brushing and aseptic solutions for acutely ill and care-dependent patients, which has been advantageous for nosocomial pneumonia patients.